In order to start teaching music on Yalp, please go through the following steps. 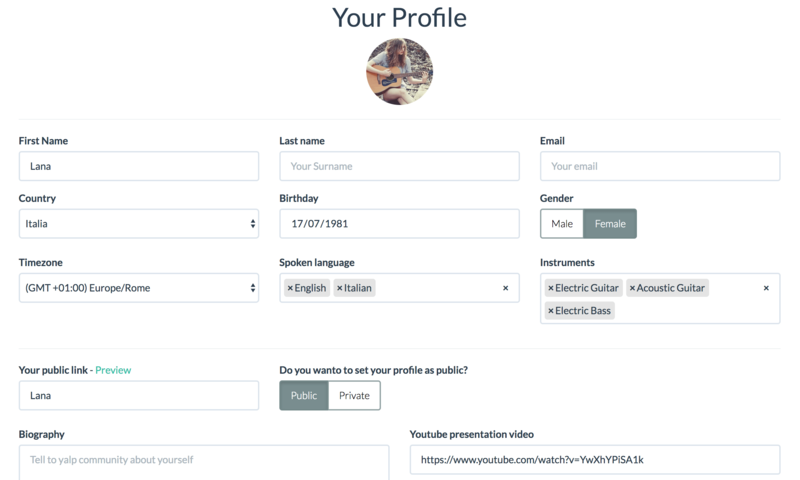 Let us know about you and your musical skills by completing your profile. Make it public to gain maximal visibility among Yalp's users. Go to your Profile page, add the information you want to share and press the "Save" button before exiting the page. Remember to upload a profile picture and add a YouTube video presentation URL. Users are happy to see your face and know a little more about you in advance. Add your favourite artists, composers and songs that inspired you and shaped your musical taste and feeling. A richer description will allow us to make both you and your students' experience more enjoyable and effective. Remember to press "Save" button when all is done. The more precise you are, the better will be the matching with user’s needs. If you have been already granted as Tutor, simply add time slots by clicking (or dragging) on the calendar. You can always change your schedule, unless it has already been reserved by a user. Plan your week in advance (i.e. every Sunday) and add time slots for the following 7 days. You can always remove it later if you are no more available. These are the only requirements necessary to perform wonderful lessons. A stable Internet connectivity. Upload & Download: minimum 0.6mbps (mega bit per second), recommended 2mbps. Keep in mind that you can optimise your video call experience by connecting to an ethernet cable. If you experience significant latency or poor-quality video call with a wireless network, give a hardwired connection a try to see if it’s better. You well receive an email as soon as a student books a lesson with you. Remember to keep your calendar updated and be patient if students struggle to reserve your lesson: matching supply and demand it’s hard work!